We've hiked a decent amount of trails since we started traveling. Most of the time they're fairly easy - we do still have a 4 year old after all! We've done a few difficult ones, too. All of those trails we've just kind of mentioned in posts about the area or threw up a couple of pictures on Instagram. But this trail gets it's own post. Because it was hands down the most beautiful, spectacular and difficult trail I've ever been on. Seriously. It all started when Ashley found Oliver Lee Memorial State Park - a first come first serve park and campground at the base of the Sacramento Mountains. She showed me one picture and the only thing that came out of my mouth was, "yes." The views from our spot alone were gorgeous. Massive mountains rising behind us with the valley laid out below on the other side. When the sun went down each night we'd just sit outside and stare as the sky and mountains shifted colors for what seemed like an hour until it got dark. We always try to grab a park map and see if there are any trails. There was a short 1 mile nature hike that we all did together and the kids really liked it. But there was this other trail on the map. It boasted thousands of feet in elevation change, and that it was only for experienced hikers. It was basically straight up into the mountains. And it called to me. 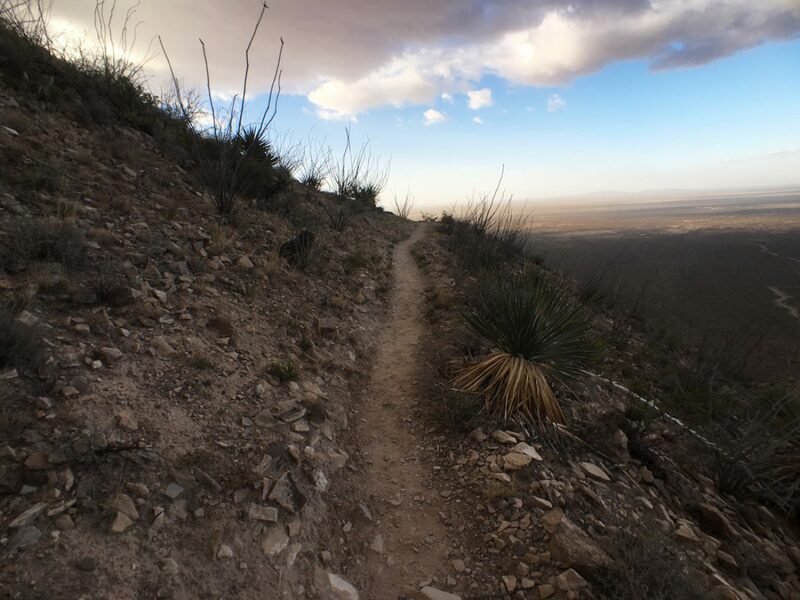 The Dog Canyon Trail is 5.5 miles long and you gain over 3,000 feet of elevation if you make it all the way to the end. Note that the 5.5 miles is only one way. Supposedly there's a road back in the mountains where you can arrange a pickup. Otherwise it's another 5.5 all the way back down. It sounded crazy, but I had to do it. Even if i went by myself. I tried to talk everyone else into it, but no luck. Only Adali (10) wanted to come. That actually turned out great, because it was a crazy trail. We wouldn't have made it very far with the little ones. So we got up early that morning, jammed our backpacks full of food, snacks and water and headed out as the sun was coming up. The map estimated up to 10 hours so we wanted to make sure we had plenty of time. It was mid March, and the weather was perfect. We ended up wearing our light jackets the whole trail, and due to some crazy high winds were actually cold some of the time. The first part of the trail plunges you right into it. Straight up at least 800 feet in elevation and lots of switchbacks. After about 10 minutes we were already huffing and puffing. This may not be good! When we got to the top of the first plateau we were informed that we were entering the Lincoln National Forest. Who knew? P.S. I dig their sign. Thankfully things evened out a bit and we had a pleasant walk for about a mile through some seriously beautiful terrain. The sun was just starting to peek up over the mountains, and the rock face to our left was lit up so much, my iPhone wasn’t even sure what to do with the color when I tried to take a picture. Even though the trail evened out, there were still a lot of ups and downs. The desert plants and cacti were just amazing - we were constantly trying to watch our step and just gape at the plants and the huge mountains on either side. Then, out of nowhere the trail opened up into a huge grassy plain in the middle of the mountains. The plants and ecosystem changed pretty dramatically. Turns out this is where Indians and later settlers would bring their livestock in the summer months to keep them cool. We couldn’t get over the massive rock face on the right, but continued down the very level trail until it started going down into the canyon. Here we crossed over what used to be a river cutting through the mountain and found the remains of an old cabin across on the other side. And by cabin I mean a pile of rocks and an old metal bed frame. Still pretty cool, though. If you have little kids this would be a great place to stop and head back. We took a quick break under the trees right behind the cabin and then continued on. I have to say, whatever we thought was difficult up to this point was a cakewalk. Because it was time to basically go straight up the other side of the canyon. Even with switchbacks, it was like we were climbing stairs for a solid mile. It was exhausting! I think we went up close to 1500 feet in elevation. Not to mention that we were constantly on the edge of the cliff. The ground was dry and rocky and really pretty slippery so we had to watch our step. Yikes! We finally made it up to “The Eyebrow” - a huge rock overhang where you can look back and survey just how far you’ve come. Wow. At this point Adali was getting pretty tired so we hiked a little further out of the shadow of The Eyebrow so we could sit in the sun and eat lunch. We were hoping to FaceTime with the others back at the RV, but there was no signal at all. After eating we started again, and it was more of the same. Straight up, dusty rocky ground and drop-offs everywhere. We made it another half mile before Adali said she was ready to head back. All in all - we made it 4 miles! I was so proud of her! Well, what goes up must come down, right? Yep. We had to hike all the way back. And guess what? That dry, slippery, rocky ground was 10x worse going downhill. We went so slow the first mile and a half back. But nobody fell! So that was good. Once we got back to the cabin, we were ready to be done. We busted it all the way back. Total we were gone nearly 7 hours and we didn’t even make it all the way to the top. So they weren’t kidding about that 10 hour round trip thing. So yeah - in case it’s not obvious a trail like this should only be attempted if you have plenty of water, food, clothing and sunscreen. And you’re in fairly decent shape. When the map says for “experienced hikers” it was serious. I’m not sure I could have made it a whole other mile and a half up to the top and been back before dark. But seriously guys, this was just the most amazing hike. The views, wildlife and difficulty of the trail were perfect. If you find yourself in Alamogordo, NM head on over to Olive Lee Memorial State Park and make the trek into the mountains. It’s worth the trip, I promise. Oh, and just in case the pictures didn't give you an idea of the scale of everything, this video might. Enjoy!